My first voyage aboard Drinian was the trip from Fair Haven, Michigan which is located on the north shore of Lake St. Clair. 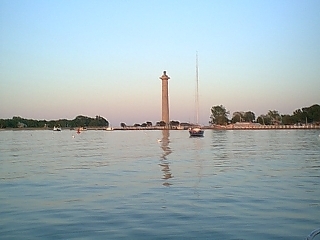 Our destination was Huron, Ohio which is located on the south shore of Lake Erie just east of Sandusky Bay. I had been warned that the water levels have been low in recent years, and getting out into the channel would be a problem if I waited too long in the season. Fortunately, the spring rains helped our cause. On Monday, June 5, 2000 we bullied our way through the last sand bar and entered the lake. The crew consisted of my son, Court, and me. Early in the afternoon, the threatening skies opened up and brought a cold rain and gale force winds. 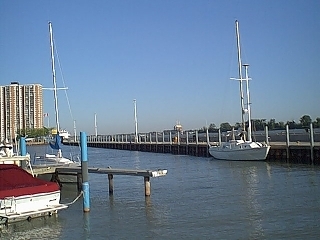 By the time the worst hit, however, we were tucked away in a marina at the north end of the Detroit River. 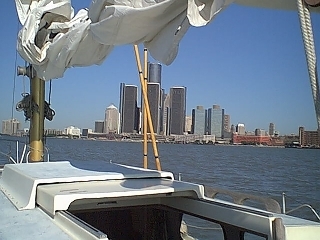 The next day, with the sun shining and the winds blowing at 15-20 knots we motored the river and made Lake Erie. The rest of the day was spent enjoying a boat that was longing to be sailed. 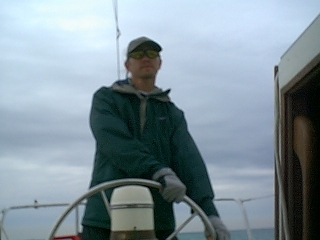 By late afternoon we had sailed and surfed our way to Put-In-Bay, located on South Bass Island.